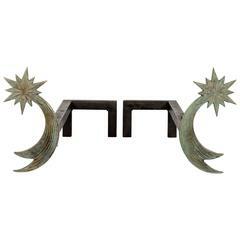 Pair of bronze andirons Perfect condition. Pair of bronze andirons designed by Enzo Missoni, circa 1970s. Dimensions are given for one piece. Patinated bronze console Signed and numbered Possibility of a second one to make a pair. Aston style andirons in polished white bronze by John Lyle Design, United States, 20th century. With turned finials above central figure of a woman. Pair of bronze and iron squirrel andirons. Pair of 19th century bronze statue andirons.